This article was first published on The Straits Times column on 12 Aug 2017. Singapore running legend Murugiah Rameshon was decades ahead of his time, though not many recognised it then. He raced against himself, lowering the national record 5 times in as many years, shaving 4 minutes off his 2:28 mark in his final record-breaking race. Then 31 years old, his final national marathon record of 2:24:22 set at the 1995 SEA Games has withstood the test of time, unwavering and dignified even after 22 years. It all started in 1987. Only 23 then, Rameshon had his first break and established himself as one of Singapore’s top marathoner by winning the Mobil Marathon. But in order to have a shot at then national record of 2:34 held by Tan Choon Ghee, he had planned to increase his weekly mileage from 70km to 120km. Grass was the only way to go: it was a more forgiving surface than tarmac with a lower risk of injury. In grass Rameshon had found an unlikely partner – one who, like him, bends but never yields to pressure. His minimalistic approach also embodied another timeless lesson – that performance in endurance running is simply and undeniably consistent hard work. But just as eggs are the hardest dish to master, the simplest is not always the easiest. Like national swimmer Joscelin Yeo, Rameshon had decided early in his running career that the best way to improve was to train overseas. But without any result to secure a scholarship, he had no choice but to go the distance on faith. Taking matters into his own hands, Rameshon balanced training and undergraduate studies at Loughborough University, England. Eventually running up a bill of $60,000 when his personal income then was a hard-earned $1,000. It was draining physically, mentally and financially. It was only after he first broke the national record at the Hong Kong marathon in 1991, did then Singapore Sports Council offer a $1,500 per year grant and he started being outfitted by Nike. It was help late in arriving, but gratifying nonetheless. Fame was never the name of the game for Rameshon. He was clear about being beholden to but not enslaved by his ambitions. “Once you see running as a conquest of numbers, then this sport, any sport, will be reduced to a race for glory.” Till today, he lives by this principle. Then as now, he believes the porousness of records cannot take anything away from the greatness sports has to offer. The irony of records is that once it’s set, its destiny is to be broken. In fact, Rameshon has been instrumental in igniting many prolific younger marathoners, spurring them to reach their fullest potential by surpassing him. Like the proverbial lamb at the altar, what matters is the kindling process. Records are but means to an end, although lesser athletes may, and often, confuse the two. 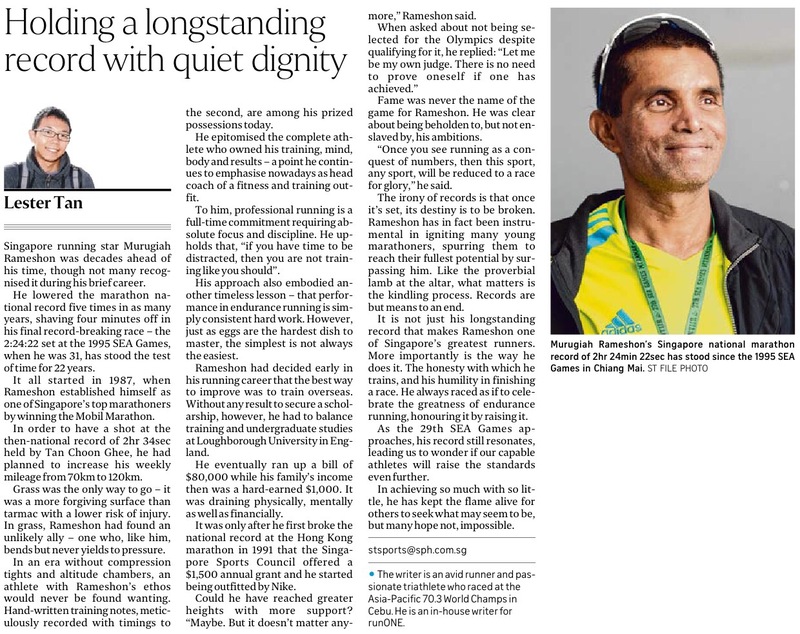 It’s not just his longstanding record, that makes Rameshon one of Singapore’s greatest runner to date. More importantly is the way he does it. The honesty with which he trains, and his humility in finishing. Rameshon always raced as if to celebrate the greatness of endurance running – honouring it by raising it. As the 29th SEA Games approaches, Rameshon’s record still resonates, leading us to wonder if our capable athletes will raise the standards even further. In surpassing the competition and himself, Rameshon eventually rose above the arena where his fame was birthed, writing a legacy beyond the numbers once ascribed to his name. In achieving so much with so little, Rameshon has kept the flame alive for others to seek what may seem to be, but many hope not, impossible. Lester Tan is an avid runner and passionate triathlete who raced at the Asia-Pacific 70.3 World Champs in Cebu. He is an in-house writer for runONE.